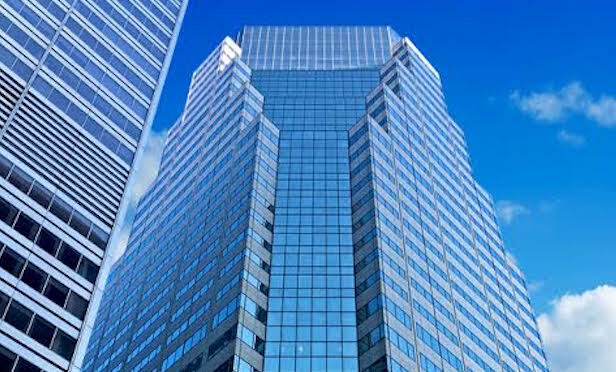 NEW YORK CITY—RXR Realty has received a $404 million floating-rate loan from Mesa West Capital for the refinancing of its Financial District office tower 32 Old Slip. Built in 1987, the 36-story, 1.15-million-square-foot office building is located in the Financial District, on Old Slip between Front and South streets. A Newmark Knight Frank team led by Dustin Stolly and Jordan Roeschlaub, vice chairmen and co-heads of debt & structured finance, with Nick Scribani, Chris Kramer and Dylan Kane negotiated the financing. The brokers point out that the building has views of the East River, New York Harbor and Downtown skyline. It has floor plates extending 38,000 square feet and 13’6” to 16’6” ceiling heights. The property also comes with a tenant parking garage. The building is over 90% leased with a weighted average lease term of more than 10 years. With over 150,000 square feet of leases that are greater than 10% below-market expiring during the loan term, RXR has invested heavily in the property. The real estate firm is currently completing a multi-million dollar lobby renovation and extensive infrastructure upgrades. Major tenants include Cahill Gordon & Reindel, DAIWA Securities, the US Census Bureau and Tradition Financial Services. RXR’s primary investment strategy focuses on New York City and the surrounding region. Led by CEO and chairman Scott Rexler, the firm manages 61 commercial real estate properties and investments valued at approximately $18.5 billion. It has a multifamily residential portfolio of 2,600 units under operation or development and control of development rights for approximately 3,700 additional multifamily and for-sale units in the New York metropolitan area.